Update: As a follow-up, the NRC is launching a Special Inspection today (Monday, Feb. 2) at the Pilgrim nuclear power plant in response to the shutdown that occurred at the Plymouth, Mass., facility on Jan. 27. The six-member team will review equipment issues experienced during the shutdown, including the partial loss of off-site power. The results of the NRC inspection will be made publicly available within 45 days of the inspection’s completion. 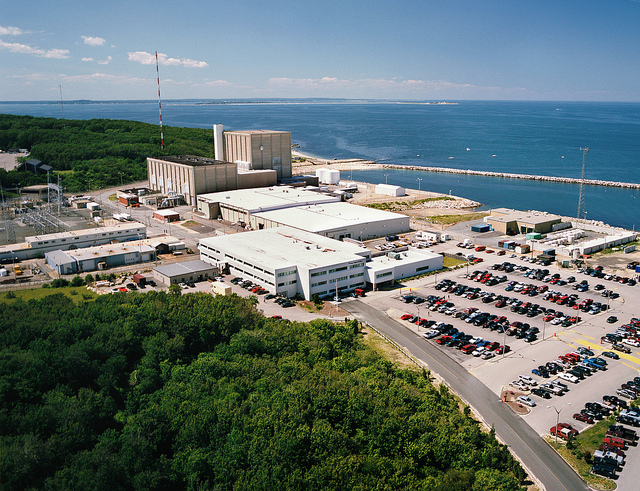 Last fall, a team of NRC inspectors was tasked with evaluating whether issues at the Pilgrim nuclear power plant that triggered increased agency oversight had been satisfactorily addressed. That team has now returned its findings in the form of a newly issued inspection report. And the answer – at least at this point in time – is that Entergy, the Plymouth, Mass., plant’s owner, still has some more work to do. Specifically, although the eight-member team has determined that, in general, the company’s problem identification, root cause evaluation and corrective action plans were adequate, it has identified deficiencies in the implementation of corrective action plans, as well as in understanding of the issues’ causes. In its report, the team cites several examples where fixes were not completed as intended or were closed prematurely. As a result, per agency protocols, the NRC is assigning two “parallel” “white” (low to moderate safety significance) inspection findings to Pilgrim. The findings will administratively replace two “white” performance indicators that initially led to the plant receiving additional scrutiny. The net effect will be the plant will continue to receive heightened attention until the NRC can perform a follow-up team inspection and is satisfied the concerns have been resolved. The NRC will conduct that additional inspection once Entergy notifies the agency of its readiness for it. To back up for a moment, the Pilgrim plant’s performance indicator for Unplanned Scrams (shutdowns) with Complications crossed the threshold from “green” to “white” following the third quarter of 2013. Then, in the fourth quarter of last year, the performance indicator for Unplanned Scrams per 7,000 Hours of Operation also changed to “white,” something that occurs if a plant has more than three such shutdowns during the designated period. This placed Pilgrim in the Degraded Cornerstone Column of the Action Matrix used by the NRC to assess plant performance. Pilgrim has not had any unplanned scrams since October 2013, and the performance indicators discussed above are currently “green.” But the assignment of the white findings will keep the plant in the Degraded Cornerstone Column pending successful completion of the supplemental inspection. The NRC intends to discuss the inspection results during the Annual Assessment meeting for the plant. That meeting will likely take place in March near the plant, but a date, time and location have not yet been firmed up. With the latest Confirmatory Ltr to ANO. I’d like to know why the NRC is letting Entergy off the hook? There appears to be a whole lot of similar issues generically in ANO Ltrs that have been previously identified at other Entergy Facility. Part of the corrective actions at the other Entergy’s Facilities were to make other Entergy plants aware of those problems, so why do they keep occurring and why is the NRC allowing them to occur? That report was posted in our electronic documents system (ADAMS) on May 27th. Here is a link to the report: http://pbadupws.nrc.gov/docs/ML1513/ML15138A373.pdf . As you posted previously, the Pilgrim 2014 Annual Effluent And Radioactive Reports are routinely published in the May timeframe. When will they be posted to the NRC website? Thanks! Good points. It probably does take time. Time is on our side for any other source of power on the planet. Not so with potentially devastating nuclear power. Shutdown Pilgrim and then take all the time you want to do it right! Take the public off the hook not Entergy and Pilgrim! I agree and understand that the upgrade is a significant undertaking. I ‘m with you. But I feel Entergy has known for a decade that the Switchyard was decaying and, as the record shows, was resolutely determined to take no action, NRC be ignored. Extend and delay! Perhaps meet the quarterly EBITA budget more easily. More of the same in the Entergy’s latest declaration. Entergy is not cooling “Hoodsies”, but 1,200,000 lbs. of toxic nuclear waste on the shores of our honored beginnings. That is an unforgiving imperative. I’m not trying to defend Entergy, but as a power industry employee, grid changes are very challenging to perform. The stability studies can take months to years to ensure the changes don’t cause undesirable consequences. Additionally for plants in merchant markets, their companies no longer own the grid and in some cases they don’t even own their switchyard, meaning that all changes have to go through the grid’s operating company, who is often back logged with work to do. Again not trying to defend. Just trying to give perspective that even if entergy knew what they needed to do today, the grid operator may still need months to years to do studies, budget the equipment changes, and install them. If you’ve ever worked with an industrial company who needed changes to their electrical infrastructure, it’s sometimes like pulling teeth to get the grid to even agree there is a problem. I agree they need improvements, but sadly it’s not an overnight/turnkey thing to do. On May 27, 2015, Lauren Burn, spokeswoman for Entergy issued a statement on the most recent Inspection Report. ” We are currently studying several options to improve the long term reliability of the Switchyard during severe weather”. Give me a break! In the January 26th, 2015 Pilgrim Inspection Report on the loss of power on the Feb. 8th, 2013 Scram, the report reads,” Specifically, the inspectors noted the corrective action to conduct an engineering study to determine feasible Switchyard upgrades to determine feasible Switchyard upgrades to improve the resistence to flashovers due to ice- bridging on insulators was extended ELEVEN times. At the time of the inspection( 21 months since the event) Entergy has not made a decision as to whether the modification would be funded or implemented”. As you will note, The Switchyard connection failed again TWO days later after the release of this report and was instrumental in the course of the JUNO Scram. A sad state of affairs. So Entergy is still “thinking”, “studying”, and taking it all under advisement again. That is reassuring. How can the NRC put up with this defiance and public refutation of their previous findings that called for action? Why all this forbearance? Is it some kind of “band of brothers” sentiment? Bob Meyer of the Professional Reactors Operator Society calls the Pilgrim shutdown the most significant nuclear event of 2015 which challenged operations and equipment. This is no big deal – well maybe. I fear the NRC will say that Entergy has learned its lessons -again, and ask the Plant when would be a good time to stop by when they feel they are ready. Cross your fingers! I get it, the NRC is hamstrung by congress and the politicians. They above all have to follow the rules. My advice to all, get your behind out there and vote!!! I have the highest respect for you, but respectfully this is my take away. I don’ t believe in the past, Pilgrim has ever followed an AOP or EAL for a voluntary shutdown; many times it just Looped, Scramed, and went offline when hit with a big storm. I believe the precautionary 2015 Neptune Storm shutdown set a new precedent at Pilgrim because of perceived dangers. The NRC knew after the Juno Scram in January, the plant would predictably fail again, as it did in 2013. The NRC conjectured, we need a backstop for an eventuality we can’t contain. Why? Because we have a defiant operator who won’t upgrade a broken, compromised Switchyard. These precautionary shutdowns will become more routine in the future and every time will be a tacit admission that NRC oversight has failed to correct the underlying problem. Each U.S. nuclear power plant has criteria on actions to be taken in the event of severe weather. For example, if wind speeds exceed a certain level, a plant would have to shut down. For most plants, their Abnormal Operating Procedures (AOPs) and Emergency Action Levels (EALs) will direct plant shutdown based upon actual and forecasted wind velocities to ensure the associated safety-related systems remain operable. Look for a future blog post on the upcoming hurricane season and plant preparations. Seriously though Don, I love your idea of a protocol for reactor shutdowns. It should not only be applied to Pilgrim but to every nuke plant in the USA and the world for that matter! If anything greater than a water spout or a tropical depression or a even a mild thunderstorm approach’s any nuke plant anywhere they should be immediately shutdown. Then not only the folks in Boston could feel better but the rest of us as well. Of course the emphasis should be on PREVENTING loss of power incidents at nuclear power plants, as these events challenge safety systems and nuclear plant operators. Unfortunately, this seems to be an impossible task to accomplish for our nuclear industry or the entity that is supposed to regulate them! I am perplexed with the documented deficiencies of the notorious Pilgrim switchyard. The failure of Entergy to upgrade those facilities has led to numerous, repeated Scrams. At the annual meeting in March, the NRC team was critical of Entergy for allowing this problem to fester for years without any improvement, and in this case, defiantly making a mockery of the “safety culture”. If history is any indication, it could be argued that the NRC appears complicit and impotent to realize compliance from difficult providers. But now I sense there is a grand bargain. Entergy refuses to restore and upgrade the switchyard to robustness, so the NRC lowers the “ever ready” standard to allow Pilgrim to have a shutdown protocol when an intense storm is forecasted. This fix or conditional standard appears to be a dangerous path to accommodation. But there are problems. The uncertainty is still in play; the status of the Switchyard remains lamentable. The forecasted weather data may not be conclusive, in the fudge zone, or dead wrong. Entergy will argue,” don’t shut the Plant down”, to avoid the expense and bad PR. The NRC may sense it has the cover of complex, data forecast metrics and may be tempted to go along, all on the back of a broken Switchyard. Respectfully, the citizens of Massachusetts become the bag holders. Fix it, or shut it down! I have some questions. Right now do all nuclear plants have unique protocols established for reactor shutdown in advance of intense storms? In summary, what are the parameters of storm vectors/ intensity that would warrant shutdowns at Pilgrim this fall? You really allow Target Rock to profiteer over making and selling defective SRVs? One can only imagine the amount of money they made from all the operational problems they have had. . Only a limited set of plants got these safety components. I’d like to see a list nation wide with any problem they ever had with the 0867F in the special inspection. I am certain this list and explananation would lead to the conclusion these safety valves are dangerous. ***I request the NRC takeover the investigation of the Pilgrim SRVs and make an independent engineering lab investigate this. They are defective and not safe valves. We looked at Hatch with the same new install problems in 2011…the continuous down powers and so called voluntary shutdowns. You notice Hatch doesn’t even have to report what caused all those operation maneuvers and shitdown? You catch the relationship with the Palisades’s breaking off primary coolant pump impeller blades, Hatch, Fitz and the new install Pilgrim SRV problems…how they don’t have to comprehensively report these problems in the LERs? How incomplete the inspection reports are with problems like this? This is certainty/ uncertainty gaming…it is pernicious engineering and regulatory fraud. You need proof it is unsafe…the absence of proof it is safe is not necessity. In a long pattern of unreliable “new “ valves; in a blizzard of leaking valves and valves that failed to operated when called; and the blizzard of shutdowns and down powers nationwide across Hatch, Pilgrim and Fitzpatrick since 2011, the 0867F model…it is a kind of lemon car or lemon design from day one. ***I request the immediate shutdown of Plant Hatch, Pilgrim and Fitz and the replacement of the 0867F model SRV valve. The whole three stage valve. These plants are not safe with these SRVs. You get another pattern here, all the plants and Target Rock generally are fixated on treating the isolated symptoms of the defective valve…again it is a fraud. All the loose parts? Everyone is afraid to face up to the fact it is a defective and unsafe design…afraid of the consequences with shutting down four plants. Remember the unprecedented failure of the SRV bellows at Pilgrim and a leaking valve for nine months with Pilgrim declaring with certainty no bad outcome would come out of it. Then they discovered valve lifting accuracy out of specs when shutdown and it would have required an immediate shutdown if known at power. Who and what can you trust? Why can’t we see GE-SIL supplement 17? At annual meeting last night, NRC very critical of Pilgrim leadership, equipment reliability,and improvement results. What’s left to dissect? Entergy management acknowledged these shortcomings with red faces. Switchyard decay was prime focus for loss of power and Scrams, including the 2015 shaky shutdown. Over two years into this finding, Entergy, imbued in a safety culture?, has taken absolutely no action in defiance of the NRC. NRC now owns this dangerous situation and may be complicit in not intervening earlier. This situation is like asking a runner to finish a marathon with a collapsed lung! The temporary solution advanced by the NRC Is to shut Pilgrim down before storms, perhaps until the license expires in 2042. With this remedy, NRC has de facto created a new category of reactors – Part Time Reactors. The Mary and Mike tag team. Pilgrim being stuck at 22% power after storm Neptune was caused by leaking condensers tubes. How old is the Pilgrim’s condenser? Some say as end-of-times Vermont Yankee was approaching, Entergy was dragging their feet at replacing the condenser? How does the NRC explain the huge space between what was publically disclosed through the media and then what was said in that NRC Special Inspection exit meeting surrounding events during and after the storm Juno? Thanks for the update on stuck at 22% power. I see they are at full power now. Entergy is working through some non-safety related balance-of-plant equipment issues. The company is taking appropriate action to work through these issues, and they will restore full power once they are resolved. None of current equipment problems involve safety related equipment. So why is Pilgrim stuck at 20% power for way longer than 24 hours upon the Tues startup. This is highly unusual. What is broken again? Right, Entergy’s “run to failure philosophy” as expressed by the NRC itself. I get the dual message of the NRC, when the public ask the plant to be shut down in the normal manner(soft), in an approaching storm (Juno) the NRC defines the shutdown as adding more risk. But in these “HARD” and preventable…“all these preventable hard scrams, normal scrams, downpowers and shutdowns” are never characterized as driving the plant in the increase risk direction. Not once in the recent Pilgrim’s LOOPs and other hard scrams, scrams, and downpowers has the agency admitted publically these incidence had increase risk. You know, shutting down is unsafe too. Has the NRC ever expressed it as Entergy shouldn’t do it? You know guys, those LOOPs, preventable soft shutdowns, hard scrams, scrams, and downpowers entails more risk when you are shutdown. Everything was always safe during the newest loop…nobody ever whined about the shutdown entails risk too. It is just risk perspective gamming…using risk in a hidden agenda. These Catch 22 circular arguments are making me so dizzy. The licensee made a risk informed decision, and they evaluated a number of options including a pre-emptive shutdown. There was risk associated with shutting down pre-emptively in terms of reduced grid reliability, and there was a plant trip risk associated with operating during the storm. The licensee evaluated their options and made an informed decision. The decision to continue to operate was within the conditions of their license. We were aware of their considerations. During this most recent storm known as Neptune, the licensee factored in additional considerations based on lessons learned from winter storm Juno. In this case, they voluntarily decided to shut down before the storm. The decision to shut down the Pilgrim nuclear power plant was a voluntary action on the part of Entergy. It was not an action sought or required by the NRC. That said, given the forecasted intensity of this particular storm, and in light of other challenges Pilgrim has experienced during severe winter storms, this planned and orderly shutdown in advance of the approaching blizzard was a prudent precautionary action. NRC staff remained in close communicarion with Entergy throughout the decision-making process and the shutdown. Our inspectors have also carefully followed all plans to restart the reactor. As of early this morning, as reflected on the NRC’s daily plant status report, the plant was restarting and had achieved 18-percent power. NRC staff will continue to keep close tabs on all restart activities. The NRC does not currently have any General Design Criteria (GDC) concerns regarding the Pilgrim plant. I am getting from senior licenced operation’s Entergy employees on 1/27 storm Juno, Pilgrim’s Operations Department requested and advice Pilgrim plant take a precautionary shutdown prior to storm Juno. Corporate Entergy then just blew Operations off and ordered them not conservatively to stay up at power leading to a LOOP. One can only hope they didn’t withhold this information from the residents and the special inspection team??? Why didn’t operations call the NRC to intervene? Check out that luxurious amount of time Entergy is giving their employees to prepare and then shutdown the plant. Good job Entergy and NRC!!! I see pilgrim is shutting down in anticipation of a storm this weekend. Was the nrc involved? Are there GDC17 concerns with pilgrim? Thank you! Storm clouds continue to gather for Pilgrim. The Plant should be shut down permanently, and critically in advance of the strong winds, sub zero cold, and predicted high tide surge tomorrow morning! Another SCRAM near miss or something infinitively worse in the making? Why? Simply because the Plant’s infrastructure is proven to be unstable and “degraded”. The NRC knows this to be true and reams of documentation have and will fully attest to this reality. This is show time for the NRC. Protect the residents of Massachusetts and the east coast and intervene; or ignore the accumulated risks that is abject dereliction of duty. Here is another Brian Williams moment. The Pilgrim spokesman and NRC Public Affairs Office Neil Sheehan rope-a-doping the antis. At 4 am when the plant tripped Boston had 24” of snow on the ground. They were past the middle of the blizzard and these were the exact same grid instability they’d seen in Juno. They were getting control room annunciators of shorts on the line for an hour or more indicating a duel line trip was approaching. It got so bad, they were in an emergency procedure to bring them into a shutdown condition as fast as they could. They showed astounding incompetence in the shutdown was started too late…one line had tripped and everyone knew that plant wouldn’t get to a safe shutdown condition on one line. Nuclear professionalism dictates you never accept an automatic protection…you manually insert the scram before the automatic action. Mr. Sheeheen is supposed to be the neutral third party here…why didn’t he explain the true conditions of the plant scram. I do understand it is against the NRC policy to never interrupt a licensee’s spokesman no matter how bad the Brian Williams moment is? Millstone Power Station site Vice President John Daugherty slept on a cot in his office at the plant during storm Juno. The new guy sees the light. Did the equivalent (top dog) at Pilgrim ever show such concern for his employees and his plant? You are putting the individual safety of your employees at risk by forcing them to run around the plant like chickens with their heads cut off… by allowing your plant to automatically scram with a high potential of a LOOP in the middle of historic blizzard. Thank you Public Pit Bull for speaking out. It might be said that We are shouting into the wind, but as a Cape Downwinder, I will continue to focus all my energies on trying to bring light on the subject that should concern ALL of us. There is growing danger, as the Pilgrim plant grows older, facing us. It is evident that the NRC continues to protect the industry and not the citizenry. Those brave enough to buck tge ruling powers are our heroes. This is what I got a problem with…everyone only showing the most prettified version of self. Not the most completely accurate version of events. The selective release of information that only creates the most handsome profile of self. The Brain Williams in the nuclear industry? Why didn’t the NRC admit this was missed by Entergy in storm Nemo? Why didn’t the NRC catch it in 2013? If you had a special inspection in 2013, you would have caught it then and preventing its reoccurrence in 2015? What are you guys going to do if another blizzard knocks Pilgrim into another LOOP in 2015? I am predicting one diesel generator failure this time due to the accumulation to all the fast start-ups creating excessive stress on these machines. How many fast start-ups are these machines designed for considering all the LOOPs at this site and the integrated eccs testing ? Don’t even get me talking about the broken meteorological tower I caught in Nemo…it being unreliable for a long period of time before this. This impaired a possible evacuation. I got it on the Pilgrim docket. I do admit the water level is kind of insignificant in the big picture…but not knowing the limitation of your indications in a big event is bad. If the NRC’s resident inspectors or other staff note a decline in a plant’s performance the NRC can increase plant oversight according to the Action Matrix. Regional offices handle the good-to-medium levels of the matrix. Senior NRC management gets involved for the two poorest performance levels, which can trigger additional inspections, an Order or even suspension of a plant’s license. The Executive Director for Operations, with input from formal meetings involving senior management and the Commission, decides whether a plant must be evaluated outside the matrix. Plants with significant short-term declines in performance are also discussed at those formal meetings. For starters Rickover would never tolerate repetitive safety equipment failures in any of his nuclear ships or subs. Rickover, I believe, is rolling over in his grave at the incompetence of Entergy and the NRC in properly dealing with on-going and persistent equipment failures at Pilgrim. Let me bore you with a true story about Admiral Rickover as recorded in the book, Atomic America, by Todd Tucker. Way back in 1954 Rickover was overseeing the construction of the first atomic-powered submarine, the Nautilus. As testing was underway in the engine room, September 16, 1954, a small pipe broke inside the hull. The break filled the engine room with steam. Casualty procedures were implemented and no one was injured. Rickover was livid. He ordered an immediate and rigorous examination of the problem. It was found that the pipe broke because it was rolled and welded and was not the high-quality seamless pipe it was supposed to be. Furthermore, due to poor records, those investigating could not assess, as we would say today, the so-called extent of the condition. In response, even though the accident caused no injuries; was in the non-nuclear portion of the plant; and would result in construction delays, Rickover ordered every inch of the pipe ripped out and replaced. Also Rickover mandated a new quality assurance system be put in place to prevent similar breakdowns including the creation of meticulous record-keeping. If even one of Rickover’s nuclear vessels experienced a reactor scram with complications (i.e. equipment failures), he would have promptly made a personal visit to that vessel. He simply would not tolerate on-going scrams with complications jeopardizing the safety of his sailors, their reactors, and their vessels. Pilgrim has experienced automatic reactor scrams at a rate that is seven times the average of all US nuclear power plants. I was encouraged that a little over a year ago the Chairwoman of the NRC personally visited Pilgrim and shared her concerns about those Pilgrim reliability problems with the owner of Pilgrim and the public. She even was so concerned that she felt Pilgrim’s downward safety slide was reminiscent of the problems at the troubled Fort Calhoun Nuclear Station. I am sorry to say that after more equipment problems at Pilgrim, the NRC seems to be all talk and no action. The NRC needs to finally put public safety first at Pilgrim. See, Nemo according to risk perspectives more deserved a special inspection than Juno. The normal inspection barely carried the Nemo LOOP. Why was the NRC pulling their punches? It is a partial because Juno didn’t take out secondary line? at 10:49 p.m. All three off-site power sources had been restored earlier in the week. Sad to hear that Pilgrim was re-started yesterday. The NRC is once again rolling the dice with public safety. Did you know that just recently a California government official called “fracking”, “well stimulation”. Not to be outdone, the NRC recently decided that they no longer will engage in poor reactor owner “whacking”, opting instead for “reactor stimulation”. The Plant is safe with only one diesel generator? When I hear you are safe with one diesel generator I am thinking you are Entergy public relation person. Safe is in full accordance all plant licensing…anything else gets you into increasing unpredictable complexity with the immensely complex machine. So safe is a small divergence from a full normal lineup with everything working…everything outside that is unsafe territory. This is really not that difficult. Say the potential of a Fukushima accident…it forces you to think outside the mentality with how we fix our cars. I might make the case, taking care of a fleet of large passenger airplanes also forces you to thing in a manner different than how the average person thinks. It is more closer to how a parent thinks about the safety with their small child. If you teach the multitudes to think about nuclear power plant in the mentality of fixing a car of truck…the nuclear industry won’t be here long. Who at the NRC has the final say in what if any action is taken in response to the safety problems at Pilgrim Nuclear Power Plant (NPP)? Do the five Commissioners decide; the EDO; the Chair of the Commission? Or is it some combination of the aforementioned? Or is it based on a recommendation by the NRC staff and then voted on by a committee? It would be very clear who decided in other federal agencies who have a responsibility for public safety. The buck would stop at the single administrator for the agency. As the NRC has no single top-dog it is somewhat confusing to me where the buck stops. Who is the NRC’s equivalent of a President and Chief Executive Officer (CEO)? When it comes to safety that safety responsibility should be clearly vested in one person. After all the NRC expects that its nuclear power plant licensees have a single Chief Nuclear Officer (CNO) who is specifically tasked with the safety responsibility for a utility’s nuclear power plant(s). If we had a single administrator at the NRC, we could depend on a Rickover-type single administrator to always put nuclear and public safety first. There would no doubt that the NRC always had a conservative approach to safety. I doubt that there would be the procrastination and indecision that currently plagues the NRC. There would be no paralyses by analyses. Instead a prompt conservative safety decision would be made that would ensure reactor and public safety! Did not know the NRC was concerned about equipment reliability issues at Pilgrim a little over a year ago. (See link below). Equipment reliability issues surfaced again a couple of weeks ago at Pilgrim. When is enough, enough?! This plant needs to remain shutdown and placed on the NRC’s troubled plant list. A thorough top to bottom look at this plant needs to be done ASAP. This plant was compared to the troubled plant in Nebraska (Fort Calhoun Station) a year ago. If a large nuclear operating company like Entergy cannot properly maintain a nuclear plant what about nuclear utilities with much smaller nuclear operations?! Keeping additional scrutiny at pilgrim side is great idea. We should keep all major factors in mind also. Try saying this title rapidly several times. (J ) Seriously though, even as robust as US nuclear plants are designed and constructed, that design can be compromised by substandard maintenance. Even with all the redundant equipment installed in these plants and the defense in depth design philosophy, a poorly maintained plant is a dangerous plant. At Pilgrim some safety equipment was declared operable that turned out to be inoperable and just plain unreliable. Adequate troubleshooting to determine and correct the root cause of equipment problems was lacking. So when an upset condition occurred at Pilgrim a couple of weeks back, plant operators not only had to contend with the upset condition they had to contend with some unanticipated equipment failures. Nuclear power plants are designed to remain safe even in the event of a postulated accident. That design even assumes that a single component (valve, pump, diesel generator) will not only fail but will fail at the worst possible time. For example, at Pilgrim, both diesel generators started automatically after off-site power was lost, just as they were designed to do. Even if a single failure occurred and one of the diesels failed the other diesel could handle the situation just fine by itself. However, if other components in the plant that the operators believed were operable were not in fact operable, the best nuclear safety design is compromised. Poor maintenance at Pilgrim set up the reactor operators by unnecessarily challenging them, and put reactor and public safety in peril. In his book, Reactor Accidents, David Mosey examined seven reactor accidents including those at Three Mile Island and Chernobyl. He found what he termed as “institutional failures” on the part of nuclear plant owners and their regulators. In light of the close call at Pilgrim recently, one of those institutional failures seemed particularly applicable to the Pilgrim event-“failure to acknowledge or recognize an unsatisfactory or deteriorating safety situation”. Entergy knew about safety equipment problems at Pilgrim but did not appropriately address and correct them. These equipment problems surfaced again when the loss of offsite power event occurred at Pilgrim. The Pilgrim reactor operators then not only had to contend with a serious initiating event but had to work around equipment failure after equipment failure in the plant. They did a masterful job in doing so under extreme duress. No responsible plant owner and operator should allow for such lousy maintenance practices at a nuclear power plant. A good friend of mine once compared the potential of a reactor accident to the three reels on a slot machine. The labels on the reels are left to right, “initiating event”, “equipment failure”, and “operator error”. All three reels aligned left to right to cause the accident at TMI. The first two reels lined up recently at Pilgrim. When will all three reels line up again?! Thanks for the prompt response Mr. Sheehan. I know you do not like the comparison I make between the TMI accident and the recent Pilgrim shutdown. Let me try and explain my rationale. Equipment malfunctions precipitated both the TMI accident and the recent Pilgrim event. Proper operator response at Pilgrim prevented an accident. Improper operator response at TMI caused one. The NRC caused the accident at TMI. Entergy caused the close call at Pilgrim. Improper NRC training of reactor operators directly lead to their improper response at TMI. Entergy’s failure to properly correct known equipment problems at Pilgrim directly caused big problems for the reactor operators at Pilgrim recently. In my view Entergy has been grossly negligent in taking proper care of the Pilgrim plant. Only the Pilgrim operators prevented a serious safety outcome at Pilgrim. So safe means not getting severe core damage or exceeding the fence line dose radiation of 5 rem. What does the NRC mean by safe? As related to the 2013 LOOP, that was declared a LOOP and this new guy is a partial LOOP…what is the difference? One of the plant’s safety relief valves was being monitored for leakage prior to the event. It was available but not used during the shutdown. A second safety relief valve did not open upon operator demand. The plant’s other two safety reliefs were used and functioned satisfactorily. The 23-kilovolt off-site power line feeds the plant’s shutdown transformer. It is considered a secondary off-site power source; two 345-kilovolt lines are the primary off-site power sources for the site. If those 345-kilovolt lines are out of service, the plant’s emergency diesel generators activate and supply power to safety systems. During the recent shutdown, the emergency diesel generators were performing that function and therefore the 23-kilovolt line was not needed for that purpose, but it remained available if needed. During the 2013 storm-related shutdown of Pilgrim, the 23-kilovolt line was rendered unavailable. The NRC would not agree with any comparison between the Jan. 23rd shutdown of the Pilgrim nuclear power plant and the partial reactor meltdown at the Three Mile Island 2 plant in March 1979. TMI 2 was the worst accident involving a commercial nuclear power plant in U.S. history. The recent Pilgrim shutdown was carried out safely and neither the public nor plant workers were in any danger during the event. There was a partial loss of off-site power at the site amid blizzard conditions. Issues involving certain safety systems and components also surfaced. The NRC launched a Special Inspection at Pilgrim earlier this week to closely evaluate those problems. However, the plant has emergency diesel generators that activated and provided back-up power to safety systems. And the plant is equipped with multiple safety systems and therefore was able to place the reactor in a safe shutdown condition in a timely manner. How can the NRC inspect itself at the Pilgrim Nuclear Power Plant? Recall that a little over a week ago this NRC Blog noted that, as part of the preparations for a dangerous winter storm in the NE, additional NRC inspectors were dispatched to the Pilgrim Nuclear Plant. These inspectors were in addition to those normally assigned to the plant as so-called resident inspectors. These inspectors were assigned to the plant to make sure the plant was really ready to cope with this dangerous storm. These inspectors were there before, during, and after the storm passed. They were there last week when the near-miss accident at Pilgrim occurred. The near-miss reactor accident involved a loss of off-site power and several equipment malfunctions that challenged the Pilgrim reactor operators. All this and no emergency condition was declared at the site at the time. Now the NRC has dispatched a special inspection team to the site to investigate. How can the NRC fairly and objectively evaluate the response to this near-miss accident when NRC folks were intimately involved?! This is a huge conflict of interest. I am afraid that this special inspection will not be rigorous as the NRC itself has “skin in the game”! As details emerge regarding the near-miss accident at Pilgrim Nuclear Power Plant, we find that the Pilgrim reactor operators had to face more equipment malfunctions last week than the operators at the Three Mile Island Nuclear Power Plant faced over 35 years ago. Furthermore, the equipment malfunctions at Pilgrim involved equipment that had prior reliability problems. The malfunctioning equipment included safety relief valves and reactor emergency makeup and cooling systems. These so-called “conditions adverse to quality” were never effectively corrected at Pilgrim. Thank God the Pilgrim operators were able to overcome these malfunctions; otherwise we could have lost Boston. Not declaring an emergency condition at Pilgrim last week, when it was clearly warranted, was the last straw. I find I simply can no longer trust Entergy and Pilgrim to do the right thing. Pilgrim has a poor and inconsistent safety track record to boot. “Trust is built with consistency.” Lincoln Chafee. The NRC and especially those that live near Pilgrim and county and state emergency personnel have to be appalled at Pilgrims’ lack of regard for public safety. “Trust everybody, but cut the cards.” Finley Dunne. I am glad the NRC is sending a special inspection team to “cut the cards” at Pilgrim. We will see if the NRC can truly be an objective investigator or will they continue to be in the pocket of large nuclear operating organizations like Entergy. I am glad the NRC is dispatching a special inspection team. From the sketchy info available the automatic shutdown of the plant had complications including a partial loss of offsite power and problems with a reactor cooling system safety/relief valve. Why wasn’t an emergency declared promptly at Pilgrim?! Certainly it seemed as though conditions for at least a Notification of Unusual Event classification were met. The definition of a NOUE are…”Events are in progress or have occurred which indicate a potential degradation of the level of safety of the plant…” “Purpose: The purpose of this classification is to assure that the first step in future response has been carried out, to bring the operations staff to a state of readiness, and to provide systematic handling of unusual event information and decision-making.” Seems that Entergy and its Pilgrim plant are once again failing in their responsibility to put public safety and a conservative approach to reactor safety first. Did the SRV have indications of leaking through abnormal tail pipe temperatures (high)? Strangely I didn’t see in the Nemo Blizzard LER a mention of the: “ A third off-site power line, a 23-kilovolt line, remained available’. The use of this guy is not in the USFAR and in the plant licensing LOOP coping accident studies. That is why it was never used. Let me get straight, the line is not used (or approved) though Plant licensing and the USFAR. As far as I can see, I can’t detect it even being connected up to the plant in Blizzard Juno because it is so unsafe. That seems like a change in the licensing conditions of the plant and we should have had a thorough safety verification in a 50.59 and licensing amendment request change. I am wondering if this line is only going to be use as violation mitigating strategy and an inaccurate means to reduce public insecurity….essentially being not safe to use at the plant. I see no LAR after blizzard Nemo? It sounds like a manual breaker? Additional information on this is still being gathered. What we can tell you at this point is one of the plant’s safety relief valves failed to open when operators attempted to use it during the reactor cooldown. Entergy is performing a root cause analysis, and an NRC Special Inspection Team will be looking into this further. It is too soon to speculate as to the cause of valve failing to operate as expected. Ok, was Entergy’s new resonance frequency and vibration limits or requirements as defined in the new SRV contract specification (pre 2011) …the resultant reduction of quality in these new valves from the old style…is that a change to the licensing and conditions of the facility? Adverse to quality…not according to plant licensing and the USFAR. Did this change really need a 10 CFR 50.59… permission to change the licensing and conditions of the facility from the NRC through a Licensing Amendment Requirement change? There was a LAR for these valves now that I think of it… was the change in resonance frequency requirement specs and the resultant reduction in the quality of the valve components, did that get disclosed in the LAR? I remember it being a like for like except for the enhancement with the three stages. How come it wasn’t updated? “I know leaking SRV valve failure to open by switch has happened in other plants because of leaking pilot valves…I just can’t explain how it occurs. I once could easily explain it:) I believe the failure to open by switch with an SRV at Pil this LOOP comes from them operating with leaking SRV for a prolong periods of time. I have not completely yet translated this into a common mode issue…the reason why all SRV could be called inop. These are brand new 3 stage SRVs…the first leak developed within weeks of the first startup (2011). Target Rock used inferior parts. The outage they put the brand new valves finished in May 2011. Entergy documents say the first leak first developed in Apr 19, 2011. I doubt vibration could cause a leak in a matter of weeks with a new valve…it would take many months and maybe a year for normal steam line vibrations to cause a valve leak even with inappropriate specs. Remember both these guys do pre installation testing of these valves. Pil blames it on steam line resonance vibration damaging parts…Entergy didn’t put in the purchase specs the correct resonance vibration limits. Entergy frames it as the steam line vibrations haven’t changed…it was a matter of not the right resonance specs. The leak within weeks falsifies Entergy’s justification with not having the proper resonance frequency and vibration limits in the new purchase valve specs. I blame it on putting components in the valve not according to manufacturer specs. Target Rock. Mine says it is a common mode and might be generic in nature…the resonance deal just limits it to Pil. With the experience with Target Rock in Nukes…the resonance frequency thing isn’t plausible. I am leaning on calling this a widespread cover up between target roc, Entergy and the NRC…a conspiracy to falsify federal documents and ending in putting into nuclear plants unsafe components. The last SRV leak LER condenses all leaking valves failures into one LER…some valves and pilot valves leaking and failing more than one time. It is like they were trying to bury the magnitude of the problems in one document. The inspection reports right up to this date remained suspiciously silent on the prolonged problems with these new 3 stage safety relief valves. I was always surprised we didn’t get a special inspection on the reliability of the SRV or a focused NRC inspection on these SRV problems. What is known for certain from leaking pilot valves, the leaking degradation is unpredictable? These valves might pop open on their own, might not be able shut once open, might fail to open when call to open and the lifting inaccuracy from the leaking might require a immediate shutdown per tech specs. One such leaking safety relief valve lifting inaccuracy was discovered outside tech specs limits and if known, it would have required a immediate shutdown. You can’t tell if they are accurate at power. I am just saying every new leak should have required an individual LER and its following…then the magnitude of LERs should have keyed the NRC into taking stronger action. You are stove piping risk and the extent of problems through improper documentation and public reporting. Who knows, maybe not putting in resonance vibration limits is code words for putting in inferior grade safety SRVs into the plant trying to save pennies. Vermont Yankee had this problem. There was two grades of SRV solenoid actuators…grade I or II. Again as Pil, they were installing a new set of SRVs..replacing all SRVs. Grade I was what they needed, but didn’t have…so they put in Grade II that wasn’t qualified for the dry well temps. The inferior grade seals became brittle because they couldn’t withstand the temps…couldn’t pass the leak rate test. NRC Status Report today shows Pilgrim still down. Still on emergency backup! Information from many sources indicate that a release valve failed during the shutdown. Sea spray, snow, storm surge may have caused arcing and undermined the integrity of the on site power connections. Confidence and any residual trust have been undermined with another flawed SCRAM, after news the day before the storm of a failed inspection from the last SCRAM. Pilgrim should be shut down PERMANENTLY and never allowed to open again. Has NRC not seen enough of this obsolete and degraded Plant with troubled management? This epic story,in some dimensions, is resembling the creation of the Costa Concordia disaster. Accumulated risks and self imposed denial of acknowledged facts, allowed the events to unfold. If lives are devastated, should NRC leaders, like the Italian ship captain, not be charged with manslaughter and gross negligence? So when you sending the special inspection team? An augment inspection? Sound like I had a little birdy whispering in my ears? Just when you could think the repetitive TDAFWP couldn’t get any worst at Millstone…now we got the poor quality SRVs failing over and over again at Pilgrim for 4 years just like the TDAFW pumps did. Is this going to take three special inspection to fix just like Millstone? Wait, this is like the TDAFWP and both half capabilities electric aux feed water pumps being simultaneously inop for 4 years. You should conservatively call “all” the SRVs/ADS valves inop and not according to tech specs since 2011. I bet you the SRV was leaking for a prolonged period of time and the agency hid it on us. The hide the leak philosophy first, before fix it quickly philosophy.This caused the valve to fail.The ADS/ SRV valves were inop since 2011 when first installed. Before they even got warmed they were inop. You get it, after “new” installation of the “new” three stage SRVs (4 of them), the first leak impairing the operation of one of these valve occurred within one or two months. Maybe within weeks of first start-up. This situation is unprecedented in the nuclear industry. I’ll bet you we are heading to a cover-up of a red finding. This is not about one valve…the whole group of them have a design defect and uncontrollable poor quality components from day one. A common mode failure of the automatic depressurization system and safety relief valve for four years. These nuclear safety valves weren’t fit to be in nuclear power plant. We have had a dangerous meltdown of the effectiveness of the NRC. i am writing up a 2.206 requesting the Pilgrim plant remain shutdown. All plants in Region I should be shutdown because there was such a severe breakdown in the NRC. What level of risk would that get you to: HPIC inop, SRV/ads inop, in a LOOP and the risk of 55 loops per 100 years (52 more LOOPs than assumed in calculations)? I think this is the most severe accident we have had in a long time. Thanks for the correction PBBQ! How could an old sailor like me forget about the 25-year old Navy Electrician’s Mate Richard Legg?! Believe he was the “supervisor” of the 3. 19,000 MW thermal at SL-1 and 10,000 MW electrical for the entire Entergy fleet, right?! Legg was killed instantly when a shield plug was ejected from the runaway reactor. The shield plug pinned Legg to the ceiling of the reactor building. One of the other men died instantly as well. But the third man, although doomed by his massive head injuries and a lethal dose of radiation, somehow clung to life for a few hours. They remain the only nuclear reactor fatalities in American history. Difference in comparison is MW electrical and MW thermal. Also, kill 2 Army techs and a salior. In your release, it mentioned that in the 3rd paragraph that the “root cause evaluation” was adequate, but in the same sentence there were “deficiencies in understanding the issues causes”. Respectfully, I don’t understand the contradiction. How can that be? At Pilgrim, the NRC is presiding over a colossal failure in a dangerous, antiquated plant that threatens the whole eastern seaboard. After all your inspections, interventions, and ” tell us when you are ready” follow ups”, Pilgrim has predictably crashed again under pressure, and once again relying on emergency diesel support. These proclivities will continue with more grievous outcomes. The Plant is way beyond acceptable design limits on storage, earthquake risk, reactor containment, cooling, climate change, cyber protection, and now identification as a symbolic terrorist target. None of these issues existed in 1967 when they broke ground. They do today, they won’t go away! The NRC need to keep Pilgrim shut down and begin decommissioning. Thank you for listening! RE: As a result, per agency protocols, the NRC is assigning two “parallel” “white” (low to moderate safety significance) inspection findings to Pilgrim. The findings will administratively replace two “white” performance indicators that initially led to the plant receiving additional scrutiny. This sounds like just more NRC paper shuffling to make it appear that there is just one issue instead of two. These discussions on which color code is correct should include t least a few Outsiders, that way everyone would know what deals are being made behind what are now closed doors. Once again, Entergy can’t get it right. How long will this Lousiana based corporation be allowed to lay waste to our Bay and put our community at risk? We already have a 400% increased rate of radiation linked cancers. Pilgrim is located in a flood zone and now has three shabby “dry casks” holding lethal nuclear waste 100 feet from the shoreline. If you saw what happened in Plymouth and around Manomet during Juno and Nemo 2 years ago, you would be telling Entergy enough is enough. How long with the NRC continue to provide cover for Entergy’s management with its more NRC techno-speak, “action matrix”, “degraded cornerstones” and blah blah blah? How long with the Plymouth Selectmen sit on the sidelines? A little more on the big outfit called Entergy. They operate a nuclear fleet that generates around 10,000 MW of power (except of course when we really need the power). In the book “Atomic America” by Todd Tucker, a little low power reactor in Idaho in ’61 called SL-1 outdid Entergy’s entire fleet over a four second interval. Power peaked at 19,000 MW at SL-1 killing three Army techs. Even the late Admiral Rickover felt that nuclear power was a necessary evil to counter the Soviets. He stressed “eternal vigilance” with regard to reactor safety. Does Scrutiny ever lead to a behavior change with a licensee? Why didn’t it work from this new inspection report preventing the plant trip and newest in storm Juno LOOP. Ring that up you cash register risk perspectives with a broken HPCI and 55 LOOPs per one hundred years. Makes me laugh…have to wait until pilgrim is ready to receive the inspection? Maybe if the inspection was more timelier to the 2013 events…Pilgrim wouldn’t have had the yesterday’s LOOP. How come the NRC didn’t force Pilgrim to shut down prior to storm Juno as identified in the new inspection report, as their switchyard and the outside transmission system was so fragile for the expected climate and especially winter storms. We knew Pilgrim was going down the tubes being in 2011 when they accepted poor quality brand new SRVs (all four of them)…the pathetic host of leaks, down powers and shutdowns over this new equipment. We were shocked the agency would treat these important last ditch core cooling components so cavalierly. You know how I feel, read my 2.206s. I contend if the agency would have slapped Entergy hard in the head with a big fine or prolonged shutdown then… you would have woke Entergy up from their nap. Then Pilgrim would have sailed through storm Juno uneventful at 100% power. I call the NRC a “paper cut” regulator….the only power they got over these giant companies as incentive to get their heads on straight is to give them one insignificant paper cut after another to no results. Why is the NRC allowing our NE grid to become so fragile? Why is the two plant Millstone (Dominion) unit and Pilgrim (Entergy) going down the tubes together…why can’t the agency control these plants? I think it extremely dangerous to allow a plant to be operating in “organizational dysfunction” and impaired “safety culture” mode knowingly for prolong periods of time: repetitively spewing out of the plants safety component breakdown, unseen component degradation and showing contempt towards the agency with knowingly violating tech specs, licensing conditions and the USFARs. It is like operating your car carelessly with the on low oil pressure red warning light for days and weeks. I think it is in the greater interest of the United State of American to drive a plant early and quickly out of disorder and chaotic organizational conditions? HELLO, What about 1/28/15 (2) reports, one from last night! “On Tuesday, January 27, 2015, at 0948 EST, with the Reactor Mode Select Switch (RMSS) in the Shutdown position and Pilgrim Nuclear Power Station (PNPS) at 0% core thermal power, the High Pressure Coolant Injection (HPCI) system was isolated by the main control room operating crew and declared INOPERABLE. HPCI had been in service for reactor pressure control following the automatic reactor scram experienced during winter storm ‘Juno’ reported in EN# 50769. It appears there was a malfunction of the HPCI turbine gland seal condenser blower or associated condensate pump. Reactor pressure control was transitioned to the safety relief valves and the reactor cooldown was continued. The plant is stable. The Emergency Diesel Generators are powering the safety related 4KV buses and reactor water level is being maintained by the Reactor Core Isolation Cooling (RCIC) system. HPCI is required to be OPERABLE in accordance with Technical Specification 3.5.C.1. Since HPCI is a single train system, the INOPERABILITY is reportable in accordance with 10CFR50.72(b)(3)(v)(D). The cause of the HPCI malfunction is not known at this time and troubleshooting continues. “This event had no impact on the health and/or safety of the public. Shutdown cooling is in service. The licensee will notify the State and local governments and plans on issuing a press release. The NRC Resident Inspector has been informed. Plymouth, MA — The Nuclear Regulatory Commission says a power plant in Massachusetts has lost power and shut down during a massive snowstorm.